The doors for Great Hall slammed open and the night’s freezing wind entered the room making the great fires fickle. A lone figure was standing at the entrance of the hall, his long robes covered his armour and a hood was covering his helmeted head. The red eye lenses though had an eerie glow emanating from the darkness beyond, and it was the only thing that was discernible from his face plate. The Dark Angel looked at him through the red lenses that pierced the shade of his hood and stopped. - I am Captain Semper of the First Legion, Lord of Light and Faith, Master of Recruits. When I go to battle I carry a mace, a relic of the Unforgiven. It is called “Lux ex Tenebris” and has been wielded by mighty Dark Angel heroes before me. It has slain the heretic, the mutant and the filthy Xenos countless times and continues to do so under my charge! It was inscribed by the Lion himself bearing the motto: “Imperium Sine Fine”. With an abrupt move he set his robes aside, pulling out an oversized power maul with an obsidian head that seemed like it was absorbing the light of the Great Hall making the surroundings somewhat darker. The body of the mace was made from an unassuming dark metal not dissimilar to that of the ordinary bolter but the handle was covered in a deep-red studded cloth that seemed almost unused. With a push of a button the maul was energized sending a bright light accross the Hall forcing his eye lenses to compensate while those with unprotected eyes were taken aback needing some seconds to adjust. The Dark Angel looked around him. Every gun in the room was pointing at him (he even noticed a heavy bolter held by what seemed like an ancient warrior) but the Terminator that had blocked his way previously stood lazily in his corner looking… amused as if he knew the true reason for Captain Semper’s presence in the Great Hall. The Dark Angel slowly hanged his mace on his waist allowing his white robes to cover it again. - But enough of that. I’m here for another reason. I have a debt. And I have come to repay. Only Forte’s laughter could be heard in the Great Hall. In the wake of the E TENEBRAE LUX and after the dust has settled I was left with a debt to Forte and the Space Wolves forum. The debt is that I have to paint Arjac and a few Wolfguard Termies to go with him. I intend to fully repay my debt. However, given the tons of DA goodies that are in the pipeline, starting with the Dark Vengeance boxed set and escalating to the (expected) release of a new Codex plus the FW HH series that is rumoured to start with the 1st Legion (and Sons of Horus) I really would like to economise on my spending. I recently acquired the AoBR boxed set that I had resisted so far (don’t ask why, OCD at its best) so I intend to use the Termies from that box but with some weapon swaps from my bits box(es). Don’t worry – they’ll look Wolfish enough! To compensate, I’ll build and paint the AoBR Dreadnought too! In the bowels of the Fang, Captain Semper was following Forte’s hulking Terminator form through a wide corridor that looked somewhat narrower now that Forte was occupying it. They were both silent until Forte spoke with his deep, booming voice. - We are going to Lord Bjorn Stormwolf’s Great Company quarters. If you want to fight with the Wolves Dark Angel, you’d better meet them first. As Forte was about to push the gates open, he turned again to Captain Semper. - Dark Angel, before we enter the Halls of my Great Company, you need to do me a favour first. - A favour? What favour? - Don’t try any of your theatrics that you pulled before. My brothers will not find them amusing. - I suspected as much. Rest assured Forte, there will be no more weapons brandishing for my part. - Ok then… Oh, and Dark Angel? As the gates opened, loud noises were filling the air and a strong smell of ale hit Captain Semper’s nostrils. The sight was puzzling: In front of a large wooden table there was a fight going on. At least that’s how Captain Semper would describe it. Not only the Wolves were pushing and punching each other, they were even throwing stools or other (often metallic) furniture around that, given their intoxicated state, it was surprisingly accurate. Captain Semper’s hand instinctively rested on the hilt of Lux ex Tenebris – his trusted power maul but he was smart enough not to unhook it from his waist. As Forte approached the centre of the Hall a large wooden bench landed on his shoulder, with a part of it hitting him on the head. As he turned around in anger, Captain Semper noticed blood dripping from his forehead. This is it, he thought, this is getting out of hand – someone will die here. To his surprise Forte was smiling – he was ready to burst to laughter! -	Only a Greenhorn would deliver such a weak blow! Where are you Arez, hiding under a table? Come here, I need you to meet someone! A battle-scarred Space Wolf in Terminator armour of his own left the rubble and walked towards the two newcomers. -	This is Captain Semper Arez, Forte said in a feeble attempt to keep up decorum. As Captain Semper thought that this was poor even by Space Wolf standards he took it upon himself to make proper introduction. I give you Arez, the second Terminator of my 5 Wolf Guards. 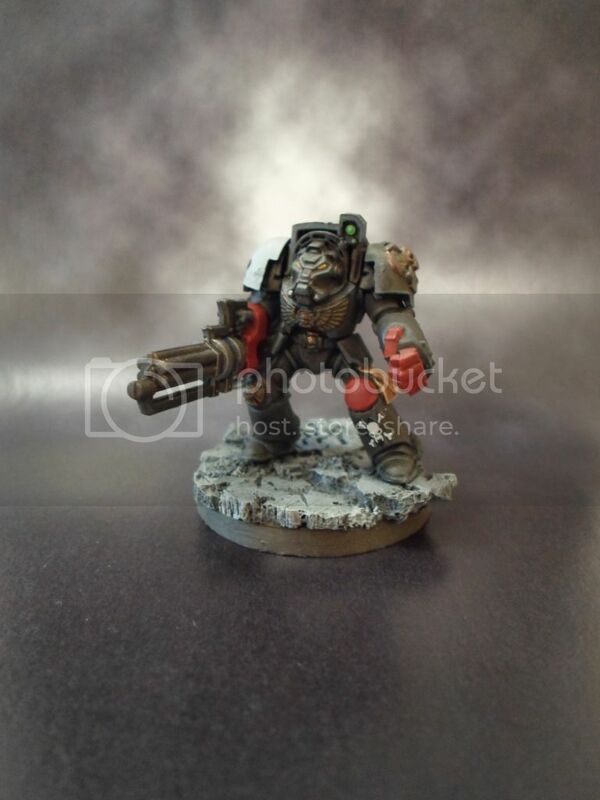 He’s equipped with Wolf Claw and Storm Bolter – hope you guys like him. As the fight subsided the Space Wolves took their positions around the wooden table continuing to drink the liquid they were calling ale occasionally pushing each other or laughing as they gulped down huge quantities of the stuff. Captain Semper joined the table sitting between Forte and Arez. He noticed that one of the Wolves stood up abruptly and left the table. - What’s with him? He asked Forte. - Drink your ale! Forte replied. - I can drink it, much like I can drink poison and survive. But I don’t like it. Do you have wine? - Wine? The Hall fell silent. Wine? Forte repeated, this time he could hardly contain his laughter. - No Dark Angel. We do not have wine! You want to fight with us? Better get used to ale. The Space Wolf that had left the table previously returned, without laughing, having a massive drum-fed assault cannon attached to his Terminator armour. The laughter subsided and everyone continued to consume their ale in a much more hushed manner. -	Who is he? Captain Semper asked Arez this time. Here’s my third Wolf Guard Terminator. 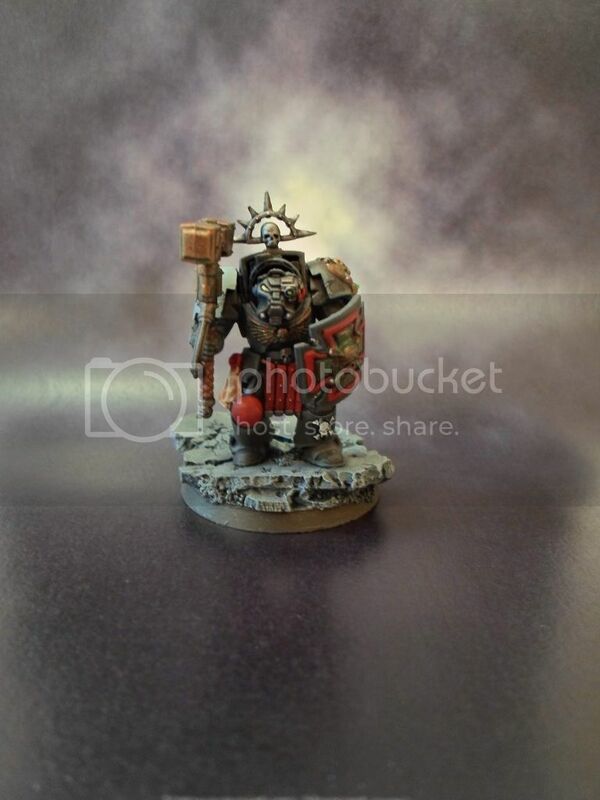 He carries a drum-fed assault cannon and an Ork head hangs from his waist… I hope he looks no-nonsense! A particularly feral looking giant of a Marine entered the room. With slow steps, and with a not-so-discreet whirring of his Terminator plate he approached the table. -	What did I miss? the newcomer asked. -	Nothing much Forte replied. There is still ale for the True Son! -	What do you mean True Son? he asked Forte. -	Once in a while, a brother has an uncanny physical resemblance to our Primarch – the mighty Leman Russ himself! I hear that this happens on occasion to other Chapters too… Those brothers we call True Sons. It’s something of a friendly banter – most of them dislike it. But our brother here seems to like it so no one uses his real name anymore. Not that it would have been otherwise if he didn’t like it. And with that he burst again in a loud laughter. 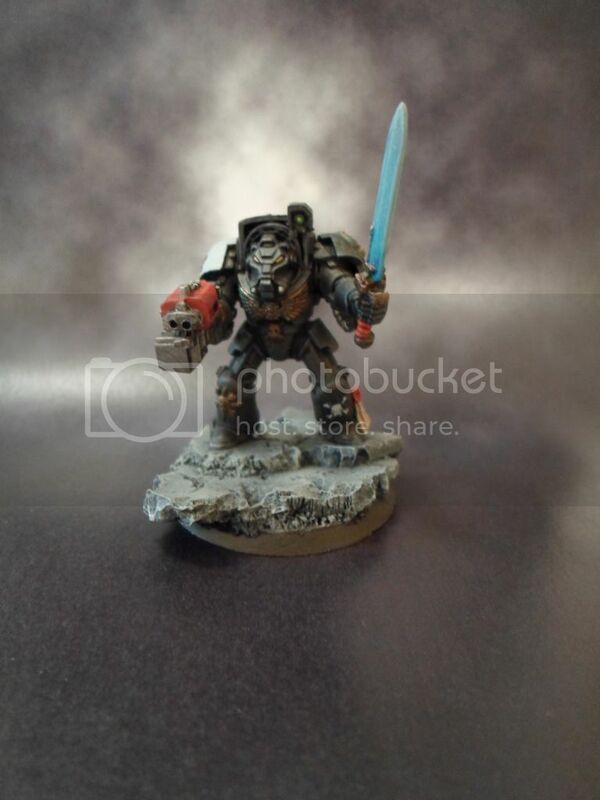 The True Son of Russ sat down, leaving his Frost Blade on the table while his Storm Bolter remained magnetised firmly on this thigh. He nodded to Rayray who returned his nod. - I know… said the True Son. Why? - Hrrmmph… ALE!!! Next thing we know they’ll send bloody guardsmen to fight with us… WHERE’S THAT ALE? -	It is time brothers… Time to transfer to the “Ultimate Hunt”! Every Space Wolf stood up as one and started walking to the Gates of their Hall. -	Who’s he? Captain Semper asked. -	He’s Wolf Guard Ethzor, Forte replied. He’s known as Ethzor the Warm! -	The Wyrm? asked Semper. -	The Warm! And the “Ultimate Hunt” is our Strike Cruiser. Now shut up. We go! As they exited the Hall, Semper turned and glanced at Ethzor. 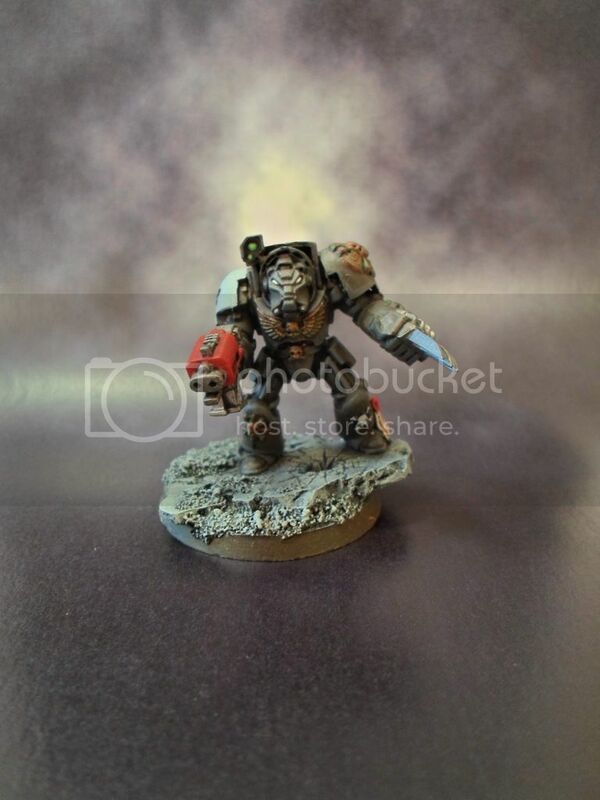 The Terminator was attaching a Chainfist to his armour. He then picked up an ornate Heavy Flamer the size of a guardsman. And all of a sudden the nickname made perfect sense. 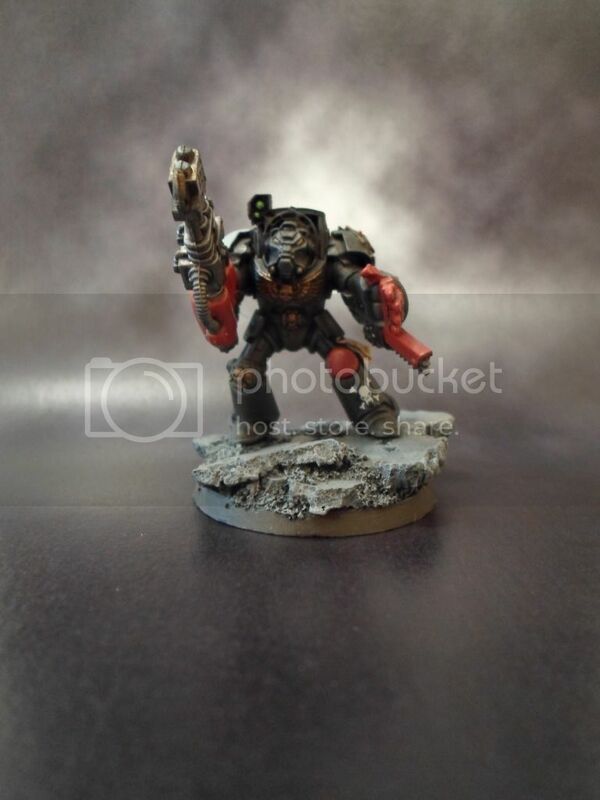 This is the fifth Wolf guard Terminator – Heavy Flamer and Chainfist. Enjoy! -	Come with me, Forte said. I will introduce you to Wolf Guard Gizur. The ancient hero will fight with us, so you need to meet him. I’m not sure he needs to meet you but that is a chance we have to take! Semper expected a laugh from Forte that never came. -	Yes, umm.., yes… well ermm, this is Captain Semper of the Dark Angels. He will be fighting with us on this mission. -	Well??? He said he didn’t like me. -	Yes he did. But you also walk with me now in perfect health. So that went well. And with that he pressed the button to open the door to the bridge as the ship’s Geller Field was energized. 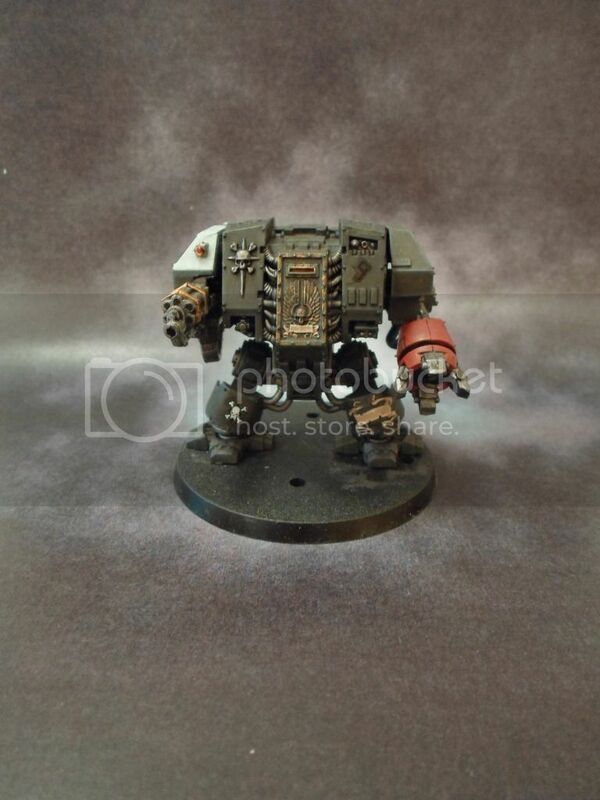 I give you the promised Dreadnought. Since I got a fetish for solid slug weapons (as opposed to energy based ones) he carries an Assault Cannon & c/c weapon with attached storm bolter. Edited by Captain Semper, 16 September 2012 - 06:07 PM. Looks good just one thing...... EVERYONE RUN! FORTE HAS TERMIE ARMOR!!!!!!!! you should get the FW upgrade pack since the official one doesnt (imo) do Arjac justice. One of our companies has spent more time in the field then your second founding skirt wearers. Yea, I said skirt! DA wear the dresses, BT are just a trashier, sluttier version of the DA with high cut skirts. only a Marine who's primarch is being held by Jawa rejects would remark on the rumors of traitors and mortals..
...Arez, thats one of those jokes that i laughed and winced at the same time. Arez is like a case of space herpes in remission; gone but never forgotten. a loud rawkus howling laughter could be heard coming from the Blood Claw rolling on the floor clutching at his stomach. After a few minutes of everyone staring at him, Forte just about managed to compose himself enough to sit up on the floor. Arms rested on his knees. His face was lined with tears and his mouth as wide as a child on the verge of more hysterics. Oh Sempre. Dear Sempre. I'm sure that there was never a time I ever said I was an old grey. Thought the pack markings would've given it away. I just have a knack for stirring up trouble. And Skadi. On a throne. We just know better than to argue with the shield maiden. forte gave in once again to his belly full of laughter as Sempre looked on. Confused, cheated, tricked...he wasn't sure. Paint a whole lot quicker than I do and are following up on your oath. Hats off mate. i wounder who the other wolves in Terminator armor will be humm well it would only be fitting if it was the rest of the usual suspects. points at greenhorn (aka arez) nice work man. Lol. The usual pack is Arez (Greenhorn), Postal, Nrth (Iron Chin. The only Blood Claw with a bushy beard) and Skadi. Is it going to be me? Noooo.... You would if you had a Champion badge in your sig. Hint: who painted the most points in the ETL from the Wolves forum? But you're next up! With a Storm Bolter and a Wolf Claw! Edited by Captain Semper, 23 August 2012 - 11:03 AM. We stand by your side in your debt paying Brother. Show them how its done! Edited by Captain Semper, 23 August 2012 - 12:59 PM. known as Skadi the She-Wolf of the Vlka Fenryka. I am a daughter of Fenris. Shield Maiden of the Rout, and pack leader of the Winter Guard. I run with the Fenris Bloods! there is no better pack, than that of a Blood Claws. For Russ and the All-father! Rayray - you're next... Assault cannon OK with you? Oh, btw, Arez' strom bolter is the first time i drilled barrels! Stobz would be proud of me! Edited by Captain Semper, 23 August 2012 - 06:32 PM. Nice work Cap'n things are looking good, can't wait to see them all lined up in their awesomeness. Minis are coming on nicely. Nice,so are you doing all your minis with the Thunderwolf symbol? Yes... This is actually the honor i'm bestowing upon forte... He won the bet so he get's to choose the Great Company... Personally I'd go for Gunnar Red Moon and his Long Fangs... You know as you age you appreciate the old warriors more! I'm just trying to put together a little story - not represent each one of you guys in detail - I might actually try that if I hang around the Fang a bit longer... hahahaha! You definitely need a Scout and LF pack... Because our veterans are superior. My finished pieces & WiPs so far. Simple. The Iron Warriors are a battered and dented vintage AK-47. Iron Hands are a modern factory fresh FN SCAR, with every piece of tech possible hooked to it. Both will kill you stone-dead, but one's a lot prettier while it's killin'. I like yer skirt Forte. Sorry I missed out on the ETL, moving, paying two rents, having no place/no people to play with brought my wolves to a halt, but I'm back for the haul now, unless another shoe drops in my life. so not only do you dare to call an elder wolf a whelp, but now your also reglecting the sacred rule of dibs and shotgun??!!! Arez, i have around another 1k worth of Wolves to be painted! Captain, these are all mighty impressive. mighty impressive.